Continuing the international theme of this year’s Vale Earth Fair, the collective are proud to welcome Jamaican Reggae artist Tall Rich to Guernsey for a night of roots reggae. Born in the East of Jamaica in 1969, Tall Rich grew up surrounded by music. His vocal style is reminiscent of classic reggae singers like Dennis Brown and Joseph Hill of Culture, blending roots consciousness with dancehall riddims. Now based in Bristol Tall Rich is pushing his music career to the fullest, and he has a strong message that he wants to be heard. This is a man who is conscious in every aspect of the term, teaching and praising the words of Rastafari - he speaks about current issues, relating to those who feel the realities of the world today. He has a signature sound in his voice, a unique spiritual positive vibe that distinguishes him from other current reggae singers. Bringing to the surface the strength of his spirituality & expressing his philosophies of Rastafari to upbeat sounds and lover’s rock riddim’s, Tall Rich is a name you will hear in a dancehall, in the home, and on the radio. Over the course of his career Tall Rich has performed live sets alongside artistes like Beres Hammond, Judy Mowatt, Maxi Priest, Sly & Robbie, Cherie Anderson , Freddie McGregor, Al Campbell & Anthony Johnson to name but a few. 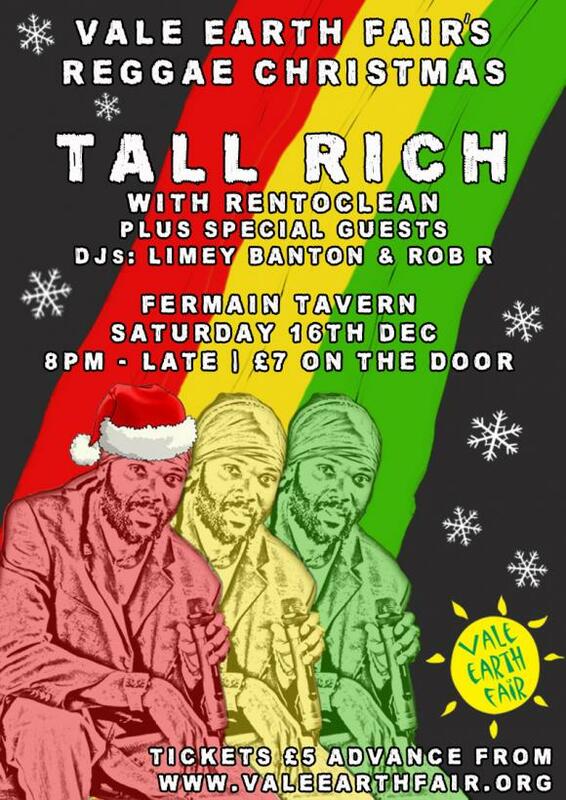 Tall Rich will be backed on the night by our own Rentoclean, and with DJ sets from Limey Banton and Rob R, it promises to be a rare night for lovers of reggae, with some special guests yet to be added to the bill. Advance tickets are on sale for just £5.00 through the Vale Earth Fair website www.valeearthfair.org, or you can pay £7.00 on the door. The music starts at 8pm and it’s over 18’s only.